Features: Chrome Plated Steel and heavy duty plastic. Easy to assemble. Easy to clean with removable pieces. Available in Clear, Black and Red Plastic.Size: 23 In. x 13 In. x 6.25 In. Features: Chrome plated steel. Expands to fit most 20 In. sinks. Holds up to 10 plates. Can be used on the countertop as well.Size: Expands 16-1/2 In. to 21 In. x 11-3/4 In. x 5 In. Available in 3 Colors Black, White and Red. Shown in Picture. Features: Chrome Plated Steel Rack. 18 In. Steel Tray And Cutlery Holder. Easy to clean. Compact Design. Resists Rust and Moisture.Size: 18.3 In. x 12.3 In. x 5.4 In. 2-Tier Wood and Chrome Plated Steel. Easy to clean with removable trays. Compact design. Easy to assemble. Available in Natural or Mahogany Finish.Size: 17.5 In. x 13.5 In. x 10.5 In.Normally Ships in 1-2 Business Days. Discount Available For Product and Shipping For Large Orders. Fancy Chrome Dish Rack with Cup and Tray. 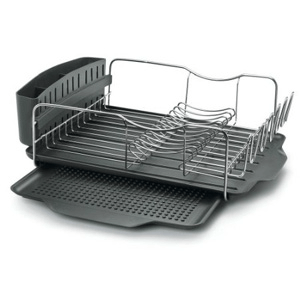 Chrome Plated Dish Rack With Tray. 13 Dish Capacity. Includes Drain Board and Cutlery Holder.Size 17.5 In. X 14 In. X 5 In. Chrome Dish Drainer Rack With Black Cup and Draining Board. 13-Dish Capacity. Rubber Draining Board. Seperate compartment for cutlery, knives and cups. Chrome metal resists moisture and rust. Availabe in Black or Red.Size: 17.5 In. X 14 In. X 5 In. Chrome Plated Tray and cutlery holder included 1 Dish Capacity 8 Cup Holders Size: 9 In. x 12 In. x 15 In. Heavy Duty Dish Drainer. Avialable in White or Black. Size: 20 In. x 13 In. x 12 In. Polder has been offering everyday products with extraordinary design since its launch. Chrome Plated 2 Tier Dish Rack - available in 16 inch and 22 In. Easy to assemble. Strong Construction.